In our daily work with young people, we know that youth today are concerned with everything from college admissions to climate change, and prom dates to politics – but where does public health and tobacco prevention fit into their world view? For those youth involved in The 84 Movement, advocating for healthier communities and policy change is a key part of their daily lives. Through The 84’s grant program, hundreds of Massachusetts teens have been agents of change in their communities, developing their own leadership skills, and impacting local policies that prevent youth tobacco use. Youth have an amazing power to share authentic stories expressing why they are concerned about the health and well-being of their peers, families, and communities – which often creates an opening to talk with policy makers from a completely new angle. Policy makers do not often hear the perspective of young people, and The 84 Movement is one example of how much the voice of young people matters. When The 84 Movement began over ten years ago, 84 percent of youth in Massachusetts did not smoke cigarettes. The 84 Chapters, located at high schools and community centers around the Commonwealth, are made up of youth who invest time and energy in raising awareness of this statistic and advocating against tobacco use in their communities. The 84 Movement harnesses young people’s energy and skills, and supports its Chapters through trainings and grants to help them take a stand against tobacco companies. Through the grant program, The 84 has created positive policy change at the local level. Grants are offered for Chapters to conduct a specific project during a given grant cycle. Administered by The 84 staff, in partnership with MTCP, we determine which project grants were most effective the previous cycle, and what types of projects should be funded in the upcoming year. Chapters can select from among several projects, and grants range in size from $1,000 to $2,000. The 84 partners with local tobacco control organizations to offer technical assistance to Chapters to help them select the project type that is most likely to be successful in their community and support the Chapters both in preparing their application and in carrying out their work. The 84 also conducts trainings with Chapters, so they have the skills they need to conduct research and speak publicly about their findings. MTCP policy goals are supported by tools in the grant program. For instance, the Community Mapping project supports participating Chapters in creating a map that pinpoints all tobacco retailers in the community and their proximity to schools, parks, and playgrounds. They then analyze the results and create a presentation for local decision-makers, such as their local public health commission, urging them to take action and change a particular policy. The 84 staff works with each Chapter before a hearing to train young people on the civic process, helping them practice skills of developing and delivering testimony, and briefs them on how to work with the media to spread their message. Ongoing trainings are offered “on demand” to 84 Chapters throughout the year to support and facilitate young people’s growth and capacity to create policy change. Youth particularly enjoy this part of the work because they are putting their passion to action while building important life skills along the way. Because of The 84 Movement, youth are advocating for what they believe in and creating healthier towns and cities across Massachusetts; and, as we’ve seen time and again, these local actions are often heeded by the Commonwealth. For example, in the State House this year, a bill has been introduced that would include e-cigarettes in the smoke-free state law; prohibit the sale of tobacco in pharmacies; and raise the purchasing age of tobacco to 21 statewide. In many towns that have an active 84 Chapter, these policies are already the status quo at the municipal level. Because of the work done locally by The 84 youth, we have an opportunity for these regulations to become a statewide reality. Youth from Brookline worked on a regulation to cap retail tobacco licenses. They presented twice at a Town Meeting on their proposal, resulting in the cap being passed. The Waltham Trailblazers Chapter worked on a photovoice project where they showcased photos from local retailers and presented to the public – including the Mayor of Waltham. They are currently working to push for stronger tobacco regulations, such as a flavor restriction, using the information they collected. Our Girls, Inc. of Lynn Chapter continued their work to cap retail tobacco licenses and raise the price of single cigars. They gathered letters of support, made a video, and testified at the hearing, where the capping regulation passed. 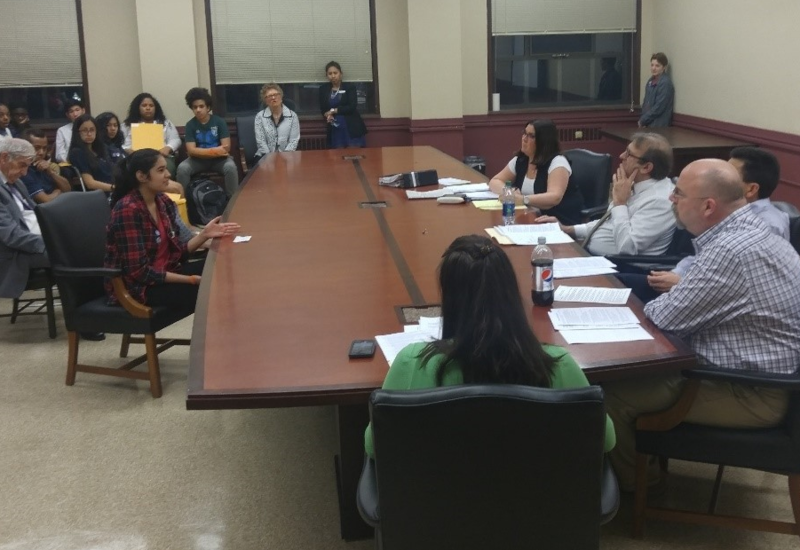 The Watertown Youth Coalition Chapter conducted community mapping to work on capping tobacco retail licenses, presented to the Board of Health, and gave a statement at a public hearing. The Board of Health subsequently passed a ban on blunt wraps, raised the minimum pricing of single cigars, and capped tobacco licenses. Youth are often assumed to be apathetic to the world around them. The 84 Movement shines a hopeful light on Massachusetts high school students. Since The 84 started, the percentage of Massachusetts youth who do not smoke cigarettes has increased to 92 percent. While this improvement is impressive, the fight is not over; clever marketing and ever-changing products by tobacco companies continue to entice youth, and, unfortunately, e-cigarette use is on the rise. Working with young people has proven to be an effective strategy of both building them up as leaders and in educating local decision-makers about much-needed policy change. Through our work engaging youth in the civic process, they have been a vitally important asset because policy makers do genuinely listen to them and act accordingly. With their compassion for their communities and interest in public health, young people have demonstrated time and time again that they can be active and effective participants in making positive change. For more information on The 84 Movement contact Carly Caminiti. To start your own Chapter, visit the84.org. Photo: Aderky, a member of Girls, Inc. of Lynn, speaks to the Lynn Board of Health in favor of strengthening tobacco policies in the city.